Khannibalism / Ernest Jenning Record Co. It is not a surprise that another album made by the legendary King Khan is superb. He makes music with an exceeding degree of excellence. His music boasts brilliant hooks and his lyricism is on point with cultural critiques. Khan, furthermore, never fails to capture an early Dylan recipe for an overall provocative sound—with an obvious note that Khan’s style is wholly electric. His structures are vivid and strikingly alive. He could sing about love gone lost or the raptures of narcissism and, in my mind, there would be a pretty and detailed picture showing it all. Khan’s new solo album combines the familiar styles of funk and surfy, psych-driven garage rock. 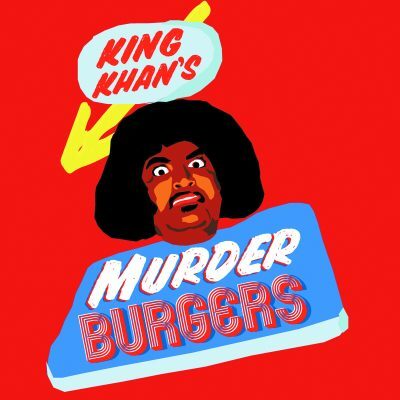 Containing 10 solid tracks, Murderburgers has themes of war, love and cultural decay. Like any other album there are tracks I would urge you to immediately consider and digest. They are “Discreate Disguise,” “It’s Just Begun,” “Born in 77” and the reworked “Born to Die”—originally heard on King Khan and The Shrines 2013’ album Idle No More. “Discreate Disguise” blends surf rock with something vaguely Western.It’s a tune with lyricism that comments on the shallowness of vanity in the form of a ballad worthy of Scott Walker’s praise. One can slowly move to this mid-tempo track, all while marveling at the unwinding of what was considered cool and all the rage in a trendy society. It’s unapologetic and solid. “It’s Just Begun” is Khan’s warning of a world that is continuing to go mad. It’s a low-tempo track with a dire message that is bigger than its sound. So, check this out and consider how all of the wars that we face today are to continue, as it’s all just begun. “Born in 77” is a great rock n’ roll number that invokes a sort of MC5 meets The Dictators feel. This is the tune to get someone jumping about like they’re hyped on caffeine and other assortments of uppers. It’s rough and raw, but easier to understand than the King Khan and BBQ Show-styled garage rock. “Born to Die,” as mentioned above, is a number found on Idle No More. The original version is funkier, while this one relies on stronger ’70s influenced psychedelic sensibilities. For me, it still captures my attention and thrills me like the original. Play this one loud with some assistance and it’ll take the mind places.